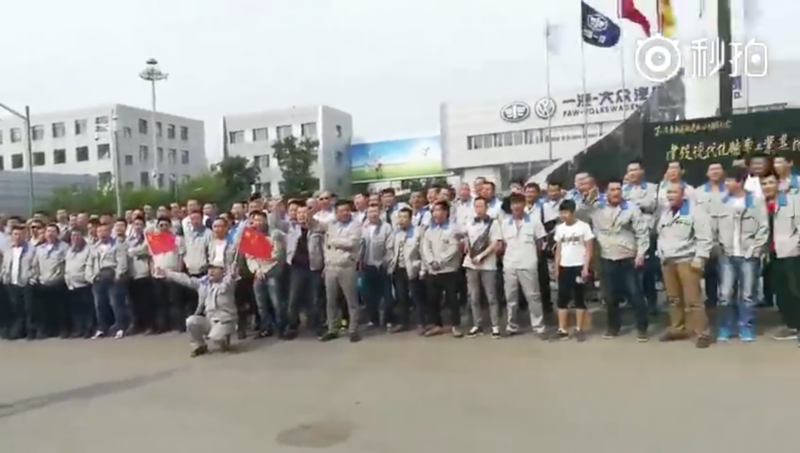 On the first anniversary of the struggle of agency workers at FAW-Volkswagen in Changchun for equal pay for equal work, we call on the Changchun municipal authorities to immediately release worker representative Fu Tianbo and for FAW-Volkswagen to return to the negotiating table. A public letter to clothing retailing giant Uniqlo about the unpaid severance, a total of more than 5.5 million dollars, to its Indonesian workers in garment factory Jaba Garmindo. Our investigation report on the working situation of workers in the hotel industry had been cited in China Labour Bulletin‘s recent story. You can now read the story below! MENG Han, a Guangdong labour activist, was released on 3 September after 21 months’ wrongful imprisonment. He was sentenced for “inciting a crowd to disturb public order” because he was merely participated in organising workers in collective labour disputes. We, the undersigned Hong Kong labour organisations, would like to reiterate that Meng was simply defending basic labour rights and exercising the right to freedom of association which, by no means, constitute any criminal offence. We are excited to publicly announce our new publication at August, 2017, a set of investigation report on the working situations of service sector workers in different industries and locations. Full report in Chinese is available for download ( click here to download) . Acknowledgement to Shenzhen Migrant Workers’ Centre and student interns for their contribution to the investigation. Industrial upgrading in Shenzhen in recent years have resulted in closure and relocation of numerous factories in labour-intensive industries. With little savings and social protection, middle-aged workers laid off face difficulties in looking for a new job and satisfy survival needs of themselves and their families. In this investigative report, we demonstrate that the situation of a group of former toy factory workers, who were laid off due to factory relocation, exemplifies the need of these workers regarding reemployment constantly ignored by the government and trade union. Workers affected in this wave of layoffs are usually in their 40s, and have worked in the same industry for years. Their skill development has been highly dependent on production requirement of the factories. The toy factory workers, mostly female, are responsible for supporting the living costs of both their parents and children. Furthermore, due to the substandard practices of their employment in social security, they are not yet eligible for pension entitlements and are not ready to withdraw from the labour market. Age limit – most factories only recruit workers below 40 years of age. Older workers find it hard to land a regular and permanent job. Insufficient unemployment insurance benefits – most workers are entitled to benefits for 1 to 2 months, but it is insufficient when it takes them 4 months to be re-employed on average. Worse working conditions – workers who manage to find a stable job report lower remunerations, lack of a labour contract and social insurance. Living needs of their own and their families’ cannot be fulfilled albeit living on a shoestring. Job precariousness – jobs in remaining toy factories in Shenzhen become more flexible. Most factories shrink in size and employ mostly temporary workers organised by foremen on commission. Duration of work in a factory ranges from 2 days to 1 month, making work highly precarious for workers. Current unemployment-related policies in Shenzhen do not fit the situations of these middle-aged workers. For instance, most workers who quit their job against their will or fail to provide proof of involuntary unemployment are not eligible for unemployment insurance benefits. The rate of benefit is also inadequate to support them over the job-seeking period. Local officials are ill-informed of related regulations to assist workers in going through procedures for job matching and skill retraining services. Policies assisting start-ups are highly inclined towards young and highly educated entrepreneurs in new and hi-tech industries, which are inadequate for the needs of middle-aged former factory workers. In face of the current economic slowdown, the Guangdong provincial government cuts unemployment insurance premium for employers, whilst the Shenzhen municipal government pay enterprises subsidies with the abundant Unemployment Insurance Fund for the sake of stabilising employment. We argue that workers are equally in need as enterprises during this difficult time, and the operation of the Unemployment Insurance Fund should be more transparent to the public. It is suggested that all workers should receive unemployment benefits for a minimum of 3 months. The amount of benefit should also be no less than the local minimum wage and subject to adjustment at least once every 2 years. All services regarding reemployment – including job matching and start-up assistance – should be extended to workers of all ages, regardless of their household registration status. The Bureau of Human Resources and Social Security to take the lead to coordinate resources and experience from social organisations in providing specific reemployment services for workers of different ages, skills and education levels. Subsidies should also be provided to workers during retraining as a motivation. Explicit discrimination of age and gender by enterprises result in obstacles for older workers in search of proper regular jobs. The central government should initiate the legislative process of the anti-discrimination law, in order to better promote social equality and progress for all. Guangdong labour activists Zeng Feiyang, Meng Han, Zhu Xiaomei and Tang Huanxing, who were arrested by Chinese police on 3rd December, 2015, were charged with “disturbing social order” by the People’s Procuratorate of Panyu District, Guangzhou Municipality in June and will be on trial in the near future. In the December incident, more than 50 activists were interrogated and seven were detained or went missing. This prosecution is part of President Xi’s crackdown on labour activists and gravely threatens the survival of civil society in China. The detained were denied the right to meet with their lawyers. Relatives of the detained appointed lawyers to meet with the activists in detention, but police turned down their requests, either claiming that the activists had already hired their defense lawyers or without providing any reasons or documentary proof at all. Zeng Feiyang was not allowed to see his lawyer for six months and in the meantime was slandered in government controlled media. Worse yet, relatives of activists have been surveilled in their homes, violently harassed or verbally threatened. It is legitimate for workers to defend their rights and seek social support when their rights are undermined. Even if this induces losses for a factory, the workers are not guilty of “disturbing public order”. Workers’ have rights to freedom of association and collective bargaining, which should be respected. Their actions to defend their rights should not be considered crimes. The Ministry of Public Security should act on its responsibilities for oversight and ensure Guangdong police protect the four activists’ rights in accordance with the abovementioned international covenants and domestic laws, which are recognized by the PRC government. The arrested persons’ rights to access effective assistance, to freely choose their own legal counsel, and to have the legal counsel appointed by their relatives fully exercise the right to defend them through to the end of the trail must be protected. The People’s Procuratorate of Guangzhou Municipality and the Supreme People’s Procuratorate should fulfill their judicial obligations of oversight by refusing to tolerate any illegal behaviour in this case. Anyone abusing their power in this case should be investigated and punished according to law. We, concerned members of civil society, will closely monitor this case. We demand that this politically motivated case be dropped and all labour right activists must be released immediately. Disney has long emphasized magic in its products. Yet, for workers in Disney’s supplier factories in China, this magic has never worked. In reality, these workers are exploited by Disney: facing risks of having their fingers crushed by the old machinery and being exposed to chemicals and dust, they work long hours but earn low wages. These people have put in a great deal of effort to produce products, thus helping to sustain and spread the fantasy woven by Disney. However, their contribution has never been acknowledged – they even lack a proper and legitimate remuneration. Mizutani (Shenzhen) Toy Factory Co. Ltd. (hereafter: Mizutani), a Hong Kong registered enterprise which mainly produced toys for Tokyo Disneyland, abruptly announced closure and relocation of its Shenzhen plant to the Philippines in June, 2015, at the request of Disney. According to China’s Labour Contract Law and Social Insurance Law, Mizutani still owed its 196 employees a total of 9 million Yuan of social insurance contribution, economic compensation (severance compensation) and housing provident fund. However, Disney only agreed to pay workers 500 yuan for each year of service as a “living allowance”, which was less than one tenth of the actual compensation amount. With the assistance of trade unions and labour organisations, workers made repeated requests for a meeting with Disney over the past year. But Disney turned a blind eye to them. In fact, workers in other Chinese supplier factories of Disney face the same exploitation. On 14th June, 2016, Students & Scholars Against Corporate Misbehaviour (SACOM) issued an investigative report, revealing the poor working conditions of workers in Disney’s supplier factories in China: workers worked over 10 hours a day on average, with 1 day off a week. Some even worked 144 hours of overtime in a month, exceeding the legal limit of 36 hours a month as prescribed by Chinese Labour Law. Besides employers’ request, the extremely low basic wage and per piece rate left workers with no choice but to work long hours in order to make ends meet. Long working hours, as well as old equipment and insufficient training, made workers more prone to injuries – a dozen accidents occurred within one month in one of the investigated factory’s departments. Worse still, injured workers were not properly compensated. In a separate report, an investigation by China Labor Watch echoed that of SACOM’s, citing issues including long working hours, low wages and exposure to chemicals. The labour organisations staged a protest at Disney’s CSR office in Hong Kong, calling for Disney to help Mizutani workers claim their missing compensation and to also improve the labour conditions in Chinese supplier factories. Again, Disney not only refused to comment, but also rejected to accept the petition. It has been one month since the release of the reports – Shanghai Disneyland has already opened its doors to create a “magical” experience for thousands of visitors. But for the plight of Chinese workers and demands of labour organisations, Disney has still “kept their doors tightly shut”. “Our dream comes true”, said Robert A. Iger, Disney’s chief executive at the opening ceremony of Shanghai Disneyland. But what about the dreams of workers? Disney blatantly violated Chinese law and its International Labour Standards Programme – which required all its suppliers to follow local laws – and have shown a complete disregard for the lives of workers. We are enraged. As the world’s second-largest media conglomerate, Disney ‘s revenue was over 130.05 billion in 2014, which is 3.14 million times a worker’s annual income at one of its supplier factories. Indisputably, this considerable revenue comes from workers’ contributions, and there is no reason for Disney not to protect them. The extravagant, newly-opened Disneyland in Shanghai is no disguise for workers being exploited by Disney suppliers. Mizutani workers are still fighting for their rights regardless of the hostility of the Mizutani and Disney management. WE writes about that with other supporters of Mizutani workers on OpenDemocracy.